fading into barely perceptible alternations of pink and green near the bottom. The bands broaden out as the film gets thinner, but the succession of colors remains the same and may be described as follows: The top of the film is black; then the colors in the first band are bluish gray, white, yellow, and red; those in the second band are, in order, violet, blue, green, yellow, red; the third band is blue, green, yellow, and red; and the succeeding bands green and red. 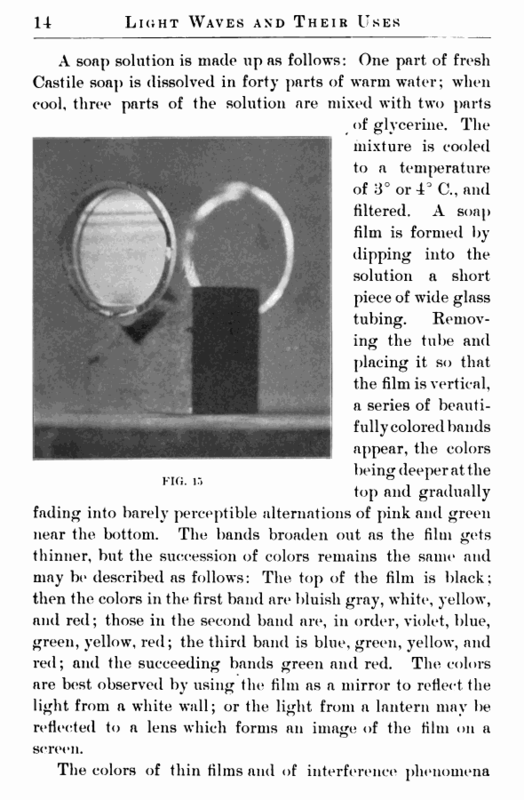 The colors are best observed by using the film as a mirror to reflect the light from a white wall; or the light from a lantern may be reflected to a lens which forms an image of the film 011 a screen.